The Toronto Zoo is Canada's premier Zoo, known for its interactive education and conservation activities. As a unique wildlife experience, we inspire people to live in ways that promote the well being of the natural world. 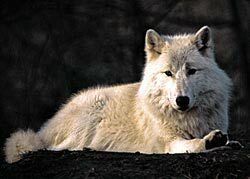 We tend not to centre educational programming around single species however we run a program for families called "Wolf Howl" — as many other zoos and parks do I imagine. It is an evening program involving about 30 people. We start with a short presentation on wolf, biology, adaptations and stories and then the group goes down into the valley to visit the wolf exhibit. 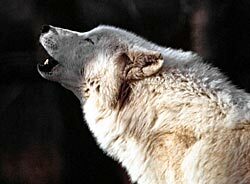 Here the leader will demonstrate a wolf howl and participants will try it out themselves. The wolves invariably cooperate. The objective of the program is to dispel myths and give people an appreciation for wolves. Wolves play a role in the Serengeti Bush Camp. This is an overnight experience for families, students, guides and scouts. They sleep in tents in the African Serengeti section of the Zoo. The evening program is mostly based on the Africa Savanna and its animals but in the morning (6:30 am) the campers are led into the valley to watch the wolves start their day. The leaders of the program get to know the wolves well over the course of the summer and are able to give information on individual behaviour, pack dynamics, names and ages of the wolves and their relationships with each other. It is one of the favourite activities of the program for campers. Wolves are included in many of the themed weeks of Zoo Camp. Animals: The Zoo has over 5,000 animals representing over 500 species. Attendance: Approximately 1.3 million visitors per year. Walking trails: There are over 10 km (six miles) of walking trails. Size: 287 hectares (710 acres). One of the largest zoos in the world.